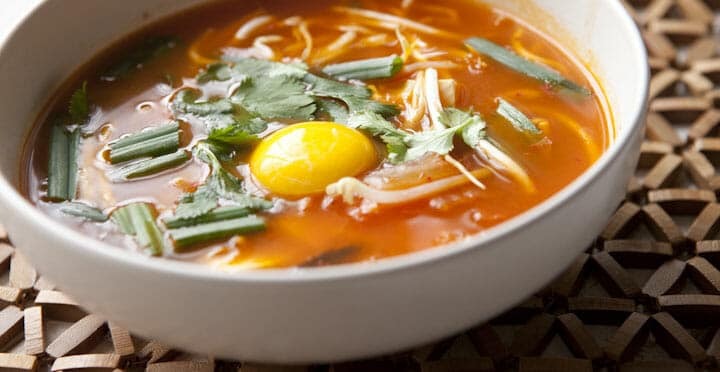 This Kimchi Stew is a wild ride of a recipe. 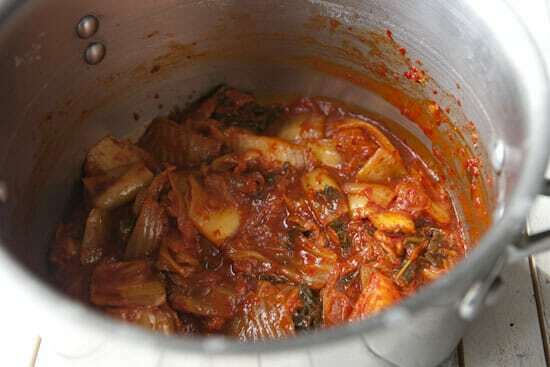 It uses a really spicy fermented Korean cabbage called kimchi. When I say uses, I mean uses. Kimchi is generally a condiment that people add to rice bowls to give it some savory, spicy flavor. This stew, however, takes that condiment and uses a truckload of it as a base. The final stew is wildly flavorful and the perfect spicy comfort food. 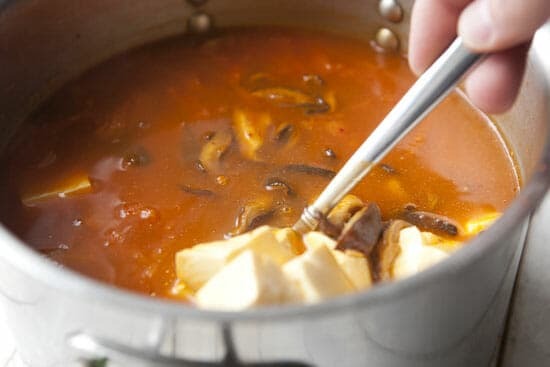 Some people use kimchi as a condiment, but I suggest you use it as a base for this spicy stew that will rock your taste buds! 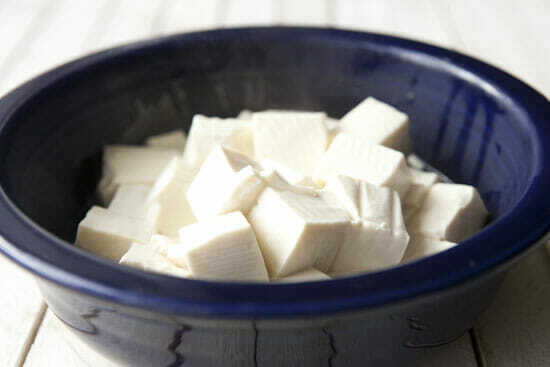 1) Bring a medium pot of salted water to a light simmer and add the tofu cubes. Simmer for 4-5 minutes until the tofu is slightly puffed. It should firm up a bit as well. Remove the tofu with a slotted spoon and set aside for later. 2) In a medium/large skillet, add a drizzle of oil over medium heat. Add sliced mushrooms and cook until they lose their liquid and brown slightly, about 5-6 minutes. 3) In a large pot, add kimchi and gochujang and cook over medium heat for 5 minutes to combine flavors. Add cooked mushrooms, water, and soy sauce. Bring to a simmer and simmer the stew for 30-40 minutes until the kimchi is translucent and tender. 4) Add the tofu to the stew near the end of cooking and cook for another few minutes. Keep stew warm until you’re ready to serve it. 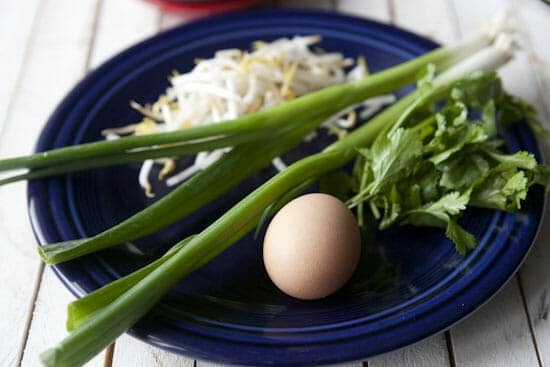 Garnish stew with fresh scallions, bean sprouts, cilantro, and an egg yolk. 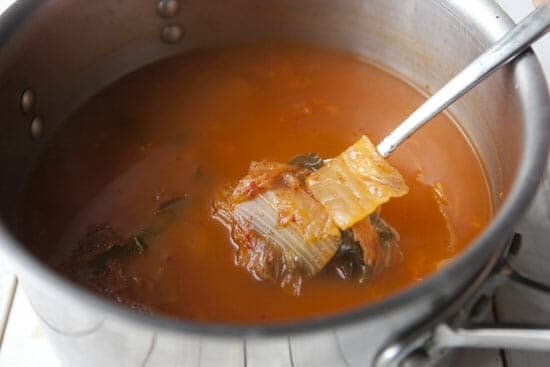 Essentially this Kimchi Stew is a cabbage stew, but not your typical bland cabbage stew. That said, it still needs some protein added to make it a real meal, and tofu is a good choice. The original recipe calls for silken or soft tofu, but I think you could probably get away with any tofu. I would maybe not do extra firm, but any other variety will work fine I think. 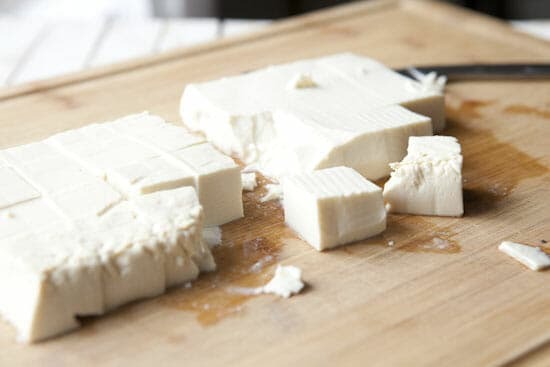 Just cube up the tofu in 1/2-inch pieces to get started. Simmer the tofu cubes in lightly salted water for about five minutes. This will give them some flavor and firm up the tofu some. They should puff ever so slightly. Then you can just drain them and set them aside for later. 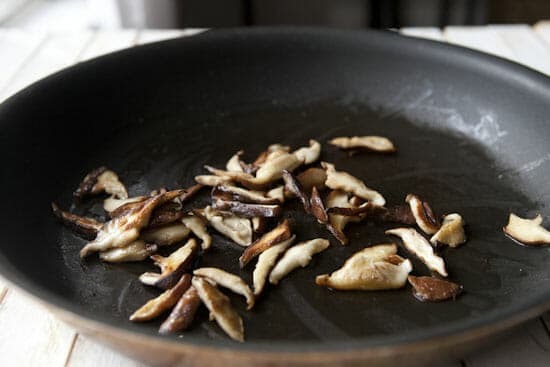 I wanted to add some extra savory flavors to the recipe so I sliced up a few fresh shiitake mushrooms, seared them in a medium-hot pan with a drizzle of oil. I cooked them until they lost their liquid and shriveled a bit. These make for a great stew add-in. You’ll need a big huge jar of kimchi for this. I used a full pound of the stuff for my version. Use all the juice and everything that comes with it. It’s all good stuff. I’ve used gojuchang approximately once on the blog for my bibimbap experiment, but I’ve secretly been adding it to all kinds of stuff I’ve been cooking (like eggs) because it’s addictive stuff. Add the kimchi and gojuchang to a large pot and stir it together over medium heat. Let this start to cook together for a few minutes. It’ll smell spicy and, well, cabbage-y. This will smell, umm, spicy. Then add the mushrooms, water, and soy sauce and bring the stew to a simmer. This Kimchi Stew will need to simmer for about 40 minutes. It’s done when the cabbage pieces are translucent and tender. Then you can stir in the tofu cubes and let them cook for a few minutes in the spicy broth. At this point the Kimchi Stew is essentially done! As with many Korean-style dishes, this Kimchi Stew is all about the add-ins. I went with some bean sprouts, scallions, cilantro, and an egg yolk. The original recipe also has sesame seeds but I just plain forgot them. 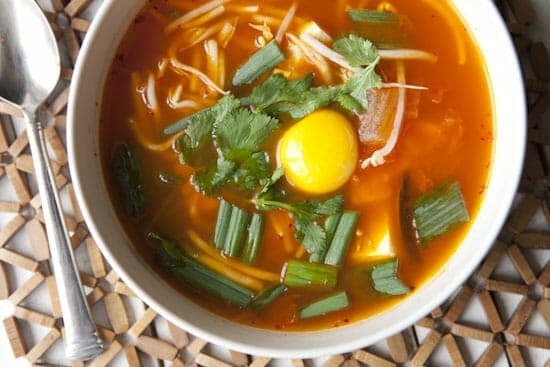 Doing a full egg would be a bit much, but the yolk is the perfect addition and helps calm some of the spicy flavors. To separate it you can just crack the egg and use your fingers to let the white drain through. 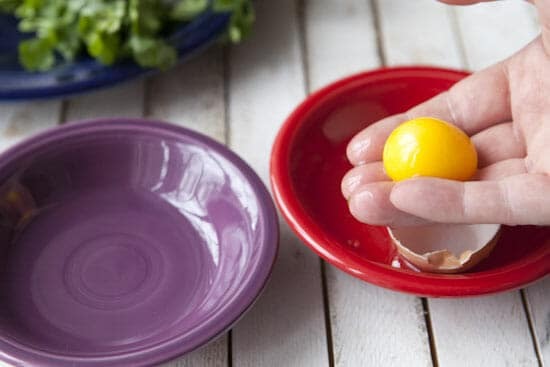 Then just toss the yolk in a bowl (try not to break it) until you’re ready to serve. Ladle the Kimchi Stew into some large bowls and top like crazy. This stew is perfect for many occasions (cold night, hungover day, etc. ), but it’s also just a great warm-up to Korean flavors. Actually, I guess it’s a warm-up like tossing a kid in the deep end is teaching them to swim. The flavors are intense, but they are totally up my alley. I’ll be making this Kimchi Stew again for sure. Where are the kimchi fans out there? Leave a comment! Creative! Looks fresh and filling. I wonder how sauerkraut would work in this stew instead of kimchi? Hmm… I worry that sauerkraut would be too bitter if you use that much. It might be okay but I think the spicy cabbage works better. This seems like it would be great for clearing out head congestion too. Sounds great, Nick. Nick, thought you might get a kick out of this. I am half Korean and so kimchi and red pepper paste are a staple in my life. 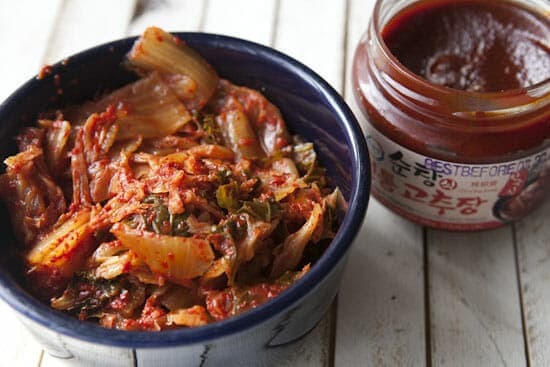 My mom makes the best hot sauce (that’s just what we call it) with the gochujang and a bean paste that we eat with rice and lettuce leaves…My husband eats this sauce on cold pizza every Sat morning after our Friday night pizza! He loves it. « Love Your Leftovers! Recipes Home » Question: What to Eat During a Move?